A black and white photograph of All Saints' Anglican Church Choir. 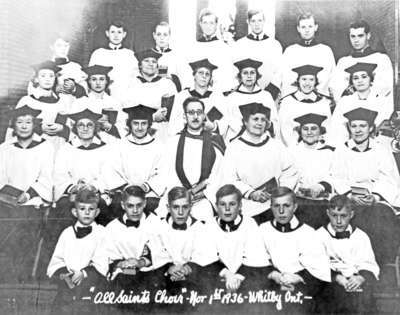 The rector, E. Ralph Adye, is pictured in the centre of the second row. All Saints' Anglican Church was built in 1865-66 at the north-west corner of Dundas and Centre Streets. The photographer, E. Mackintosh, was located at 59 Granby Ave., Toronto.